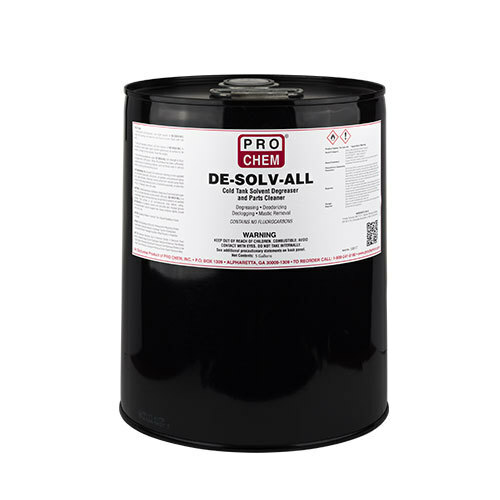 De-Solv-All | Pro Chem, Inc.
DE-SOLV-ALL parts cleaner is a 100% organic, terpene solvent/hydrocarbon blend which offers the superior degreasing and deodorizing properties of 100% d-Limonene, but at a substantial cost savings. It is a cold degreaser for use as an immersion cleaner in non-agitated vats, circulation-type units, ultrasonic, air-agitated and pressure-spray units. It can also be used to unclog drains and disposals and as an all-purpose degreaser on carpet, metal, ceramic tile, wood paneling, glass, and concrete. 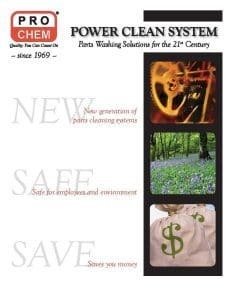 Cold Degreasing: May be used for immersion cleaning in nonagitated vats, circulation-type units, ultrasonic, air-agitated and pressure-type units. Soak until clean. If desired, remove parts from vat and spray fresh product to flush away dissolved soils. Let product evaporate, or blow dry with air. To unclog drains and disposals: Pour 8 oz. of concentrate directly into opening. Let stand for one hour or more. Flush with hot water. To clean and degrease surfaces: Add 4 oz. of concentrate to one gallon of warm water. Apply solution generously to surface to be cleaned. Let stand for 5 minutes. Rinse thoroughly. To remove flooring adhesives: Apply full strength to floor and agitate with a stiff broom. When the adhesive has been sufficiently loosened, use an oil-absorbing material to pick up the remaining liquid.